It's more than a year now I’ve been on the road. I’ve spent most of my adult life in other countries than the one I was born in. I’ve been reading and writing fairy tales for as long as I can remember. Even more stories involve a meeting between the ordinary and the unknown; indeed, isn’t that where their name comes from – fairy or faerie, that other realm that is so like our own but so utterly different. 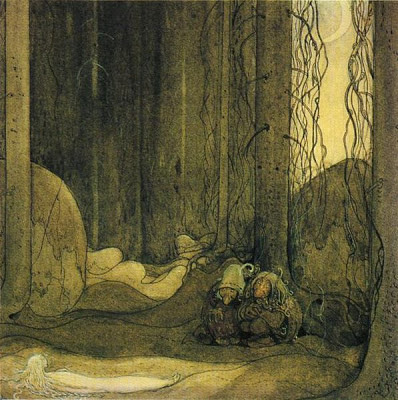 Some of my most-loved fairytales, the ones that have worked their way into my life and writing, are about encountering the new and strange, and falling hopelessly in love with it. 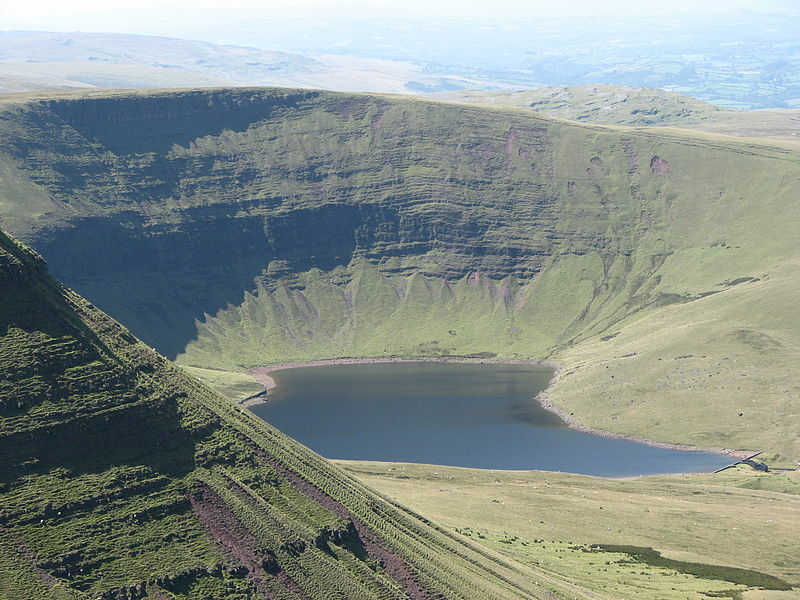 I don’t know where I first read or heard ‘The Lady of Llyn y Fan Fach’. It seems I’ve always known the story. But I came across it again on a neglected bookshelf in Kiev, in a book of folk tales from the British Isles bizarrely published – transcribed regional accents and all – in the Soviet Union. I seized on this book like a piece of home. I was sharing my life with a man from a different country, a stranger in his strange land. Sometimes I felt like I was living in a fairytale. I felt like the lady of Llyn y Fan Fach. In this Welsh tale, a shepherd by the lake in the Black Mountains sees a beautiful woman appear on the water, and falls in love. He woos her with his lunch, bread his mother baked, and finally wins her on the third try with bread that is neither over- nor under-cooked. The lady – fairy or goddess or just a stranger from a strange land, we are never told – agrees to live with the man until he strike her ‘Tri ergyd diachos’ – three causeless blows. What happens next is a paradigm of a marriage. The first time, they are late for a christening and the lady says she will fetch the horse to ride there if her husband brings her gloves. But when he comes back with the gloves she hasn’t brought the horse, and he strikes her. The second time, the shepherd strikes her at a wedding after she starts weeping loudly “because these people are entering into trouble”. The third time she begins to laugh uncontrollably at a funeral, because, she says, death puts people out of their pain. And he strikes her. For me this story is about the encounter with the unknown, its fascination and its incommensurability. Maybe the lady knows the marriage will end in unhappiness – usually in fairytales when someone is told not to do something or else, you know they’re going to do it. But she marries the shepherd anyway. Maybe she is as charmed by his difference as he is enchanted by hers; the story doesn’t tell. Yet the lady’s differences from her husband are not really between fairy and mortal. They’re the yawning gaps in understanding between two people. The first time is a classic scene of family frayed tempers. The annoyed husband strikes her gently enough (it’s always emphasised that his blows are gentle) because she broke a promise and lied to him, however frivolously; suddenly she is not what she seems. The second time, he must be baffled and embarrassed by her strange behaviour at the wedding – and maybe wondering what she is trying to say about their marriage. The third time, at a funeral, he is surely shocked by the apparent heartlessness and bad manners of this person he can’t understand. How can you ever causelessly strike the one you love? But the moment comes, the gap opening at your feet as you realise this person you love and think you know is a stranger; a liar, a laugher at funerals and a weeper at weddings, someone you simply do not know. You teeter on the brink of the pit; that’s when you lash out. There is a lovely, wise, updated Joan Aiken version of the Welsh story, called ‘The People in the Castle’. The anti-social village doctor falls in love with the lady’s silence and mystery, and is disappointed when after moving in with him she turns out to be a sociable, movie-loving chatterbox. It’s as if he’s married a swan, only to find out she is just a girl in a feather dress. That brings me to those stories in which people marry beings who are literally not what they seem: the white bear who is actually a prince; the frog who is Vassilisa the wise and clever under a spell – stories that retell ‘Cupid and Psyche’. Very often it’s glimpsing this truth sooner than they should, through curiosity, impatience or embarrassment (everyone thinks I’m married to a frog/a bear/something I can’t even see – the humiliation! ), that parts couples and sends the heroines or heroes off on their travels across glass mountains and forest of thorns to bring their beloved, in his or her true form, back home. Those are the optimistic stories. “If you had only waited and not peeked,” reproach these secretive lovers who are not what they seem. “If you had only listened to me and not opened the door.” A trust has been broken, and hardship and separation ensues. In many stories, the love, courage and ingenuity of the heroes or heroines ensures reunion, and a traditional Happy Ever After. Through these journeys to find their lovers (or more rarely siblings or parents), people discover themselves; no longer passive partners being married off or carried off, but actively seeking happiness. Other stories suggest that the whole of another person is, in the end, impossible to grasp. And if we can’t accept the ultimate unknowability of the one we love, then we are destined to live forever apart. Like the Gaelic seal bride, who always finds her seal skin however the husband hides it, and goes back to her unknowable life in the sea. Like the Japanese Sea King’s daughter in the tale ‘The Sea King and The Tide Jewels’, who leaves forever when her husband discovers her true, truly other form is that of a dragon. Joan Aiken takes pity on her Welsh doctor, and has the mysterious lady return to him one night. 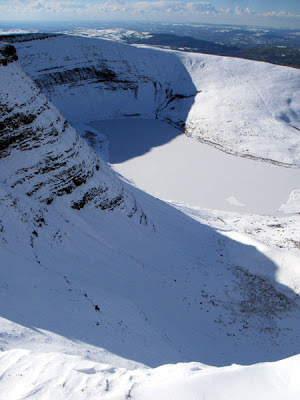 The Lady of Llyn y Fan Fach never comes back. She does show herself to her sons though and teaches them medicine, thus rooting the tale in historical reality since these sons established a line of famous Welsh physicians that continued till the 18th century. I won’t tell you the end of my own story with a beloved from a different land. But it’s only in writing this reflection that I’ve realised one of my novels, a sequel to Riding Icarus, tells just this kind of fairytale journey. The heroine, Masha, runs away from her mother, who is traumatised from an unwilling journey into the realities of trafficking, and sets off on her own journey across Siberia to Kamchatka and her absent father. There Masha meets a rat who is really a boy; she discovers her father is not what he seems – or what she wants him to be. In the end she realises the purpose of her journey wasn’t what she thought at all; really it is the true form of her mother she was trying to find and to rescue all the time. Her mother as a complicated, vulnerable person in her own right; someone Masha has to get to know just as in turn her mother has to get to know her, while both accepting there are things they will never truly understand about each other. My editors thought the ending of this book wasn’t Happy Ever After enough for its intended young adult audience. Igor, who told Masha to call him uncle even though he wasn’t, and who had found Mama a job abroad where she could earn lots of money. So Mama had gone to Turkey, leaving Masha with Granny. The story, while rooted firmly in modern Kiev, develops into a tale of magical midsummer wishes and your heart’s desire, dancing Cossacks, mystical tigers, the power of love and friendship, and an exceedingly nasty and all-too-believable villain. Lily writes with a sure but delicate touch, and the serious theme of people-trafficking is clearly hinted at without ever becoming too heavy for younger readers. Lily's second novel for children is 'Dream Land'. Lily blogs at This Trolleybus is Going East. 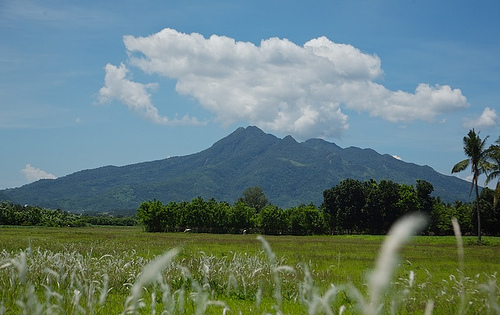 Are there such things as fairy tales in the Philippines where I grew up? If a fairy tale requires a fairy, then no - we don't have wand-wielding, tutu-wearing creatures in our woods (I would say rain forests, except most of those have been chopped down). What's in a fairy tale? Magic, certainly. An evil power perhaps - wicked stepsisters, witches, magic foul versus heroine fair. A resolution that involves come-uppance? Happily ever afters? I thought the best way to reflect on this subject was to do my own re-telling of a Filipino sort of fairy tale ... so here is my video re-telling of The Legend of the Pineapple, an old Filipino story. I grew up listening to stories like these told by my parents usually during the frequent evening power cuts that plagued my childhood in Manila. We would light candles and katol (an incense-like mosquito repellent) and sit around the dining table telling stories until the power cuts were over. The stories were always about everyday things - the turtle, that mountain we always drove past, that plant with leaves that folded when touched ... but unlike the happily ever afters of Western fairy tales, the endings always had a sadness to them. Yes, there is magic but there is a helplessness in the face of greater, unstoppable powers in these stories. And inevitably it's not good magic, but bad. The Philippines is a country always on alert for disaster - year after year, typhoons sweep in without fail, floods ruin crops, earthquakes, tsunamis, volcanoes ... living with constant catastrophe has invested the culture with a diffidence - bahala na ("Let it be" or "God wills it") is a common expression. Catholicism (we are the only Catholic country in Asia) exacerbates this fatalism. The odd thing is when I was a child, I don't think I regarded these magical stories as fairy tales. With disaster so much a part of the fabric of life, they just seemed too real to be fairy stories. I found my old school primer the other day from when I was seven years old. Now I didn't question the provenance of these stories or the other stories I read in books - the ones about Cinderellas, witches, evil stepmothers and the like. There wasn't a lot of publishing (and very few books for children) in the Philippines at the time. 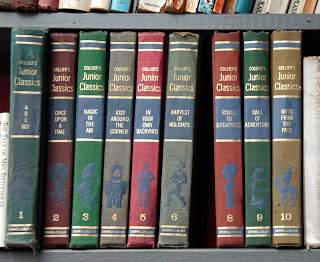 Most books were imported from America and Britain. The world of reading, for me, was about somewhere else. In those books, nowhere looked like home, and nobody looked like me - not even in one of my favourite picture books, The Five Chinese Brothers! 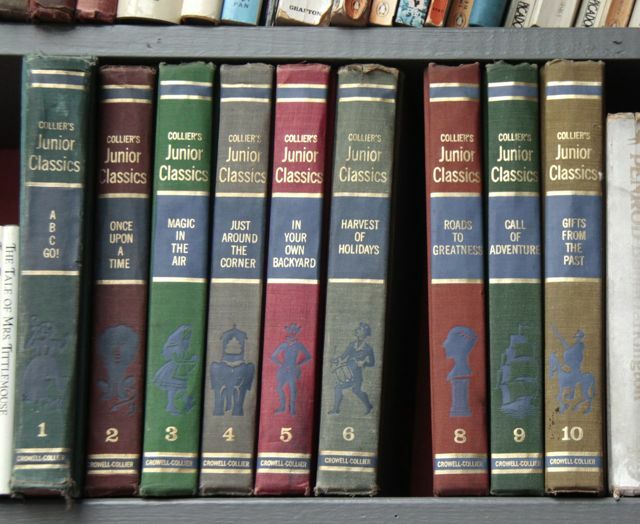 Most of my reading came from bound collections like these, courtesy of door-to-door salesmen selling encyclopedias and other bound collections that we paid for by installment. I've kept the old collection that I read as a child and dip into them to this day. It was all fantasy. Everything I read was a fairy tale. It was only when I came to live here in Europe that I discovered there really were castles and hundred acre woods and foxes and kings and twisty-turny cobbled alleys and Black Forests. It takes a big leap for me to think that those fairy tales I read as a child were based on real places and possibly real people. Huh. So those storytellers of long ago were writing about themselves. And perhaps their readers were thinking: these stories are too close to the bone to be fairy tales. 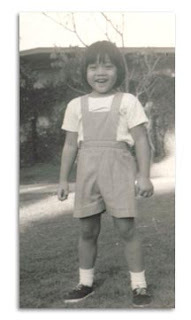 Her debut novel, 'Tall Story', published in 2010, is the story of two children. Andi lives in London, and she has two big wishes. One, she is desperate to play on the basketball team of her new school. She may be small, but she's good and she knows it. But guess what? They only take boys. Her other big wish is that her sixteen year old half-brother, Bernardo Hipolito, could come and live with them - if only the Foreign Office would grant him a visa. And finally, after years of waiting, this wish comes true. As Bernardo's plane arrives from the Philippines, Andi hopes he'll turn out to be tall and just as mad as she is about basketball. And Bernardo turns out to be tall, all right. But he's not just tall ... he's a GIANT. Tall Story was shortlisted for eleven children’s book prizes including the Waterstone’s, the Branford Boase and the Blue Peter prize. It won the Crystal Kite Children’s Book Prize for Europe. Candy's second book, book, 'Shine', will be published in 2013. My whole life has been spent trying to bring together ‘real life’ and the world of fantasy, in particular by finding new and interesting ways of expressing a sense of the magical in my writing. Ever since I was five years old, hunting down fairies in the back alley behind my parents’ house, a sense of more to life than meets the eye has been part of who I am. When I was a child, life was one big fairy tale. That was how I felt. But how to get into that fairy tale? How to make that fairy tale my life, and make it real and be a part of it? It was through stories that I found the way. I couldn’t write when I was five years old, but I could make up stories and that was what I did, standing at the garden fence, telling them out loud to the big children in the house next door, lined up on their side of the fence asking, ‘What happened next?’ But those stories, made up off the top of my head, were ephemeral. They were fly-by-nights, whereas words on paper had a strange new durability which I discovered when I learnt to write. Describing Winnie the Pooh hunting honey made me part of the story. Adventuring with the Famous Five turned them into a Famous Six. I made those things my own, and I made them real - and simply by writing about them. This is something I’ve been doing ever since. When, at the end of ‘Mad Dog Moonlight’, I wrote about a river flowing through the stars, I put myself onto that river and sailed away. When Abren in ‘Sabrina Fludde’ turned to water and flowed down a mountain, I flowed too. And when hoof-prints beat upon the hill behind my house, I knew that Wild Edric, himself - that glorious superhero of Shropshire legend - was passing in the night. By writing him into ‘Midnight Blue’, I wasn’t just making him up. The act of writing brought him to life. Tolkien defines fairy tales as stories about the adventures of humankind in Faerie, and here amongst the hills, valleys, woods and towns of my home county, Shropshire, Faerie’s all around me. It’s where I live. It’s a fabled place. And I’m twice blessed, because it also exists inside my head. Tolkien again, who wrote fairy tales for adults to read as a natural branch of literature rather than playing at ‘being children’, or pretending to enjoy them for the sake of the kids. 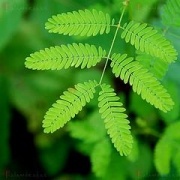 ‘When we can take green from grass, blue from leaves and red from blood, we have already an enchanter’s power,’ he wrote. And what else compares to having that power? As a child I was captivated by Hans Christian Anderson’s Fairy Tales. As a teenager I discovered Alan Garner’s ‘Weirdstone of Brisingamen’. Starting out in life as a writer myself, I fell head-first into Tolkien, and took some extracting. Finally I found my own voice and my own way into Faerie. This was a long process, which is what the word ‘finally’ is all about. For many years I thought that if I sounded like the writers I admired, Emily Bronte, Dylan Thomas, JRR Tolkien, Graham Greene – whoever the favourite of the moment might be – then I’d be a ‘proper’ writer but, if I sounded like myself, nobody would ever read me. A book of terrible short stories was published at the age of twenty-three [long since out of print, thank God], its lofty style definitely not mine. It wasn’t until years later, embarking upon ‘Midnight Blue’ that I developed the confidence as a writer to be myself. I’m indebted to that decision. ‘Midnight Blue’ would never have been written without it. 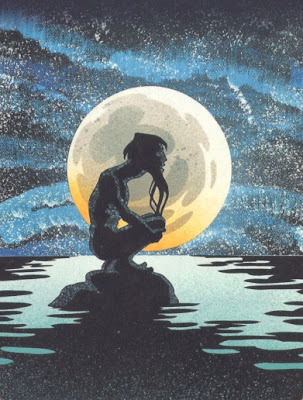 But it also would never have been written without Charlotte Burne, the first woman president of the Folklore Society, whose ‘Shropshire Folk-Lore: A Sheaf of Gleanings’ introduced me to Wild Edric, whose mysterious presence haunts ‘Midnight Blue’. According to legend, whenever England is in danger, Wild Edric and his knights rise up from their sleep of centuries beneath a rugged range of Shropshire hills called the Stiperstones, and ride out in warning of impending doom. Charlotte Burne recorded conversations with people who claimed he’d been heard and seen before both the Battle of Waterloo and the First World War. 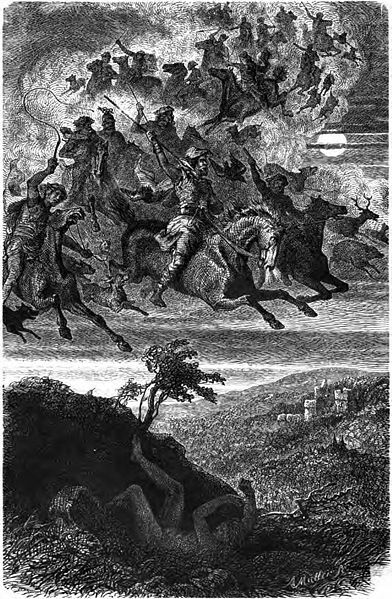 The history behind the story, as recorded in the Anglo-Saxon Chronicles, tells of a local lord who, having refused to submit to the Norman Conquest by raising a rebellion which was decisively defeated, betrayed his people by joining forces with the Conqueror. For this dastardly about-face, ‘Wild Edric’, as he became known, was doomed to sleep beneath the Stiperstones with his knights, only ever finding the release of death when England returned to her rightful people. He sleeps still, and some legends have added the comfort of a fairy wife, the Lady Godda, though others have him meeting and losing her before his days of betrayal and doom. Wild Edric’s is a great story and, both as legend and history, he’s alive and well in Shropshire. After writing him into ‘Midnight Blue’, I attended a history society meeting where local Stiperstones people claimed to have heard him riding by, and one person even claimed direct descent. And he’s alive and well in my life too. I've talked about him at a weekend I’m running on myths and legends and how to use them in creative writing. I've even led a walk up to the Devil’s Chair, where he and his knights are supposed to burst out of the ground. It’s years now since I wrote ‘Midnight Blue’, but Wild Edric has stayed with me ever since. My books have included other characters I first came across in Charlotte Burne. 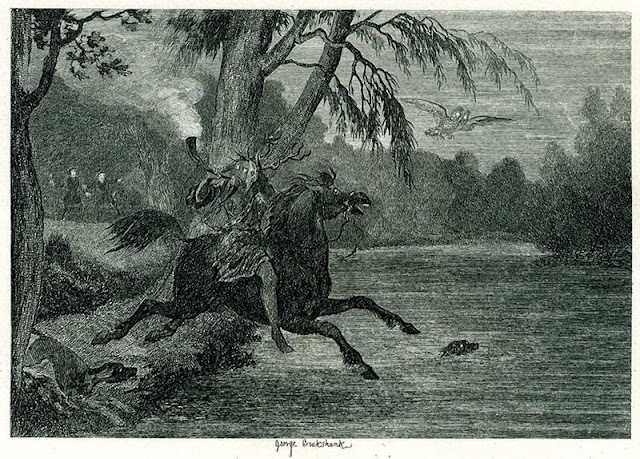 including the highwayman Humphrey Kynaston, and the goddess of the River Severn, brought to life in ‘Sabrina Fludde’. But nowhere have I found a sadder doom than Edric’s, lying beneath cold rocks, unable to die - unable even to be at peace. The romance of Edric is Arthurian. He too is meant to sleep until his country is set free. And the legend of Alderley, which Alan Garner drew on in his book, ‘The Weirdstone of Brisingamen’, calls forth sleeping knights as well. They’re a universal emblem – and yet they’re a personal emblem too, especially if you’re a writer. Every writer’s like a sleeping knight beneath a hill, brought to life when he or she has a story to tell, rising in the dark to gallop forth with a laugh, or tears or a chill breeze to broadcast to the waiting world. When I’m writing, I feel alive. When I’m not, I feel asleep. It’s as powerful as that. Maybe the idea of writers as the white-knight guardians of a watching world sounds a bit fanciful to you. But I’d say not. I’d say what we do matters more than anyone could ever say, and that the idea of an Edric who performs the role of guardian is only there because people want it, just as they want writing, and stories and people like me. So I can’t help but identify with Wild Edric. He and I are two sides of the same coin. He’s an age-old legend, trying to break free, and I’m a fresh-faced pilgrim at the gate of Faerie, trying to get in. Beyond the sky. Not ‘in outer space’ or ‘in another galaxy’, but beyond the sky… as though it were possible to peel away the edge of the blue and pass straight through. ‘Sabrina Fludde’(2001), opens with a body floating down the River Severn, the body of a lost, almost drowned girl whose memory is lost too, who plucks the strange name Abren out of the air for herself... In fact, the book is full of lost characters with strange names. In the end, Abren has to return to her own source (and that of the river) on the mountain Plynlimon, where a cold and sinister family claim her as their own. 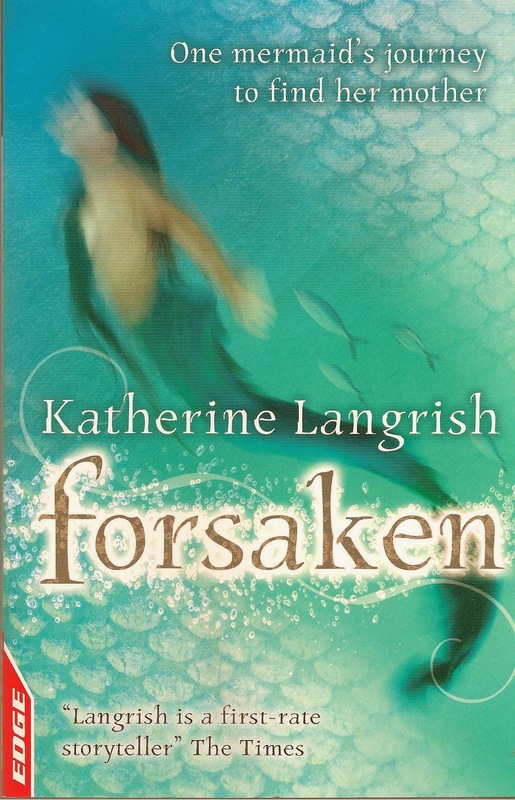 Alone and in terrible danger, she makes her escape down to the sea. And 'Mad Dog Moonlight' (2009) is another tale of a child seeking his true self and a place to belong. Pauline's latest book is 'Into the Trees', in which a boy comes to Belize looking for his father and falls in with a group of gap year volunteers. Living in the trees will change them all. Pauline's books are beautifully written, interweaving strands of the real world with airy fibres so fine, they are barely even fantasy – more like mysticism, or elemental forces. She writes about vast emotional themes of love, anger, insecurity, and the need to belong to people and a place. They leave a lasting imprint on the mind. The fisherman made all the haste he could to get to land, and there came a storm the like of which has never been known, in which many were drowned at sea. 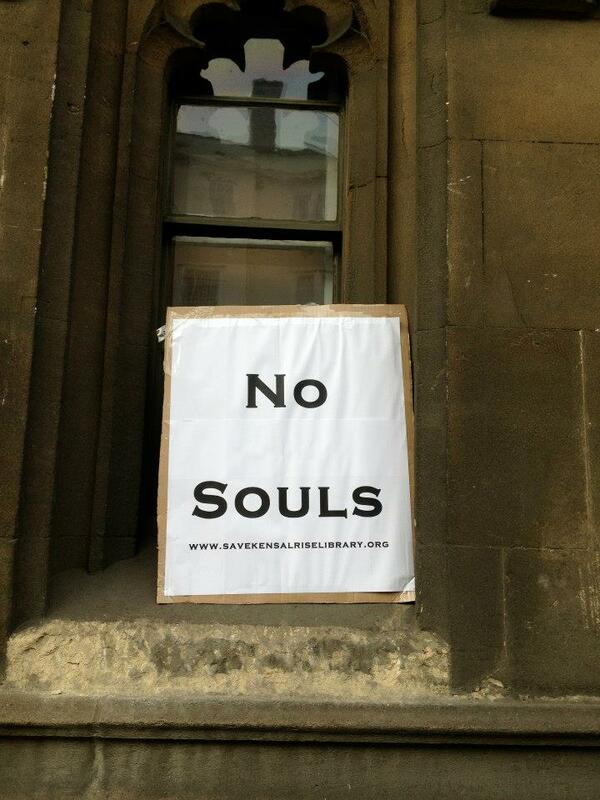 "Have a soul, All Souls!" 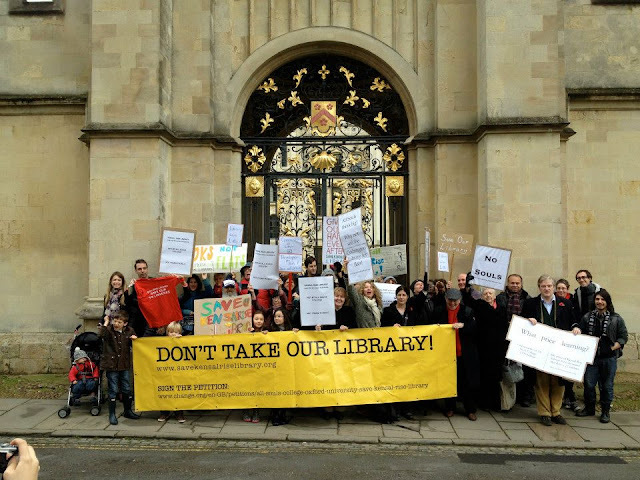 This Saturday, the 10th of November, there was a protest outside the prestigious gold-leaf-covered gate of All Souls College, Oxford. As an Oxford-based author, I went along to show some solidarity, although the protesters had been there for hours by the time I managed to arrive (delayed by guests and then by an accident that held up traffic on the Botley Road). The people who stood there on the pavement from eleven o'clock till three were the concerned friends of Kensal Rise Library, in Brent, young and old, mums and dad and kids in pushchairs, who had come on a coach all the way up to Oxford, to ask All Souls College - one of the wealthiest colleges of the University of Oxford - not to sell Kensal Rise Library to a developer, Platinum Revolver Ltd, who wants to turn it into flats. The question now is whether All Souls, to whom building and land has now reverted, will act responsibly, and in the spirit of the original foundation - and restore the building to the community? 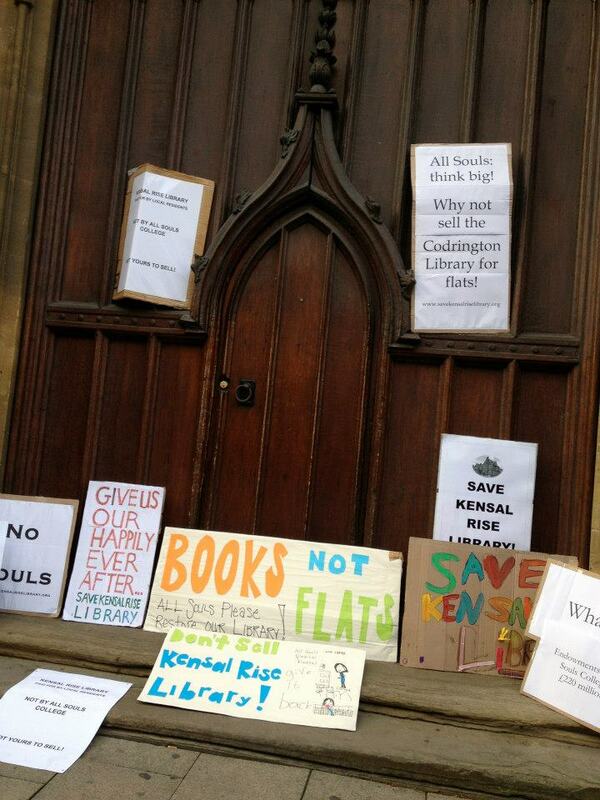 You can help by signing the petition , and joining the facebook group Save Kensal Rise Library. You'll see in the top right hand corner of this picture, a reference to All Souls' famous "Codrington Library". It would be easy to argue that All Souls ought to be just as proud or even prouder of Kensal Rise, which might not be as old as the Codrington Library, but at least wasn't founded by a man who made his fortune from the Jamaica plantations. (Christopher Codrington (1668–1710). But why should either library be endangered? 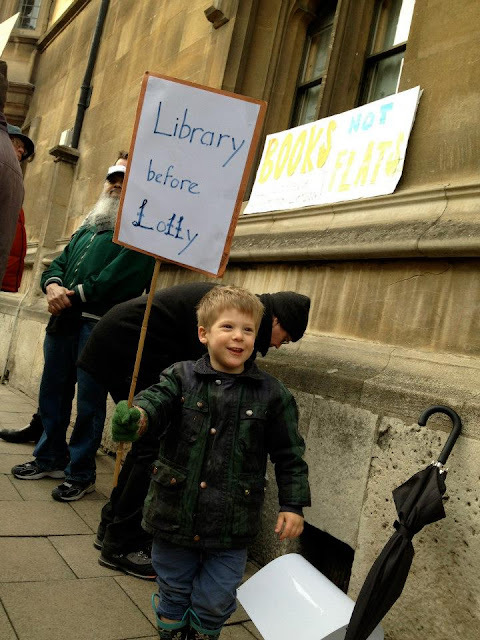 The latest news - after a highly successful and visible day out - comes from library campaigner Jodi Gramigni. She says, "All Souls were invited to join us, and although they weren't available on the day, a meeting to discuss their plans for Kensal Rise library is scheduled in a week's time." Let's hope the news will be good news. HAVE A SOUL, ALL SOULS! 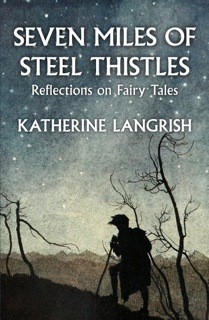 I'm taking the weekend off from Steel Thistles, as today you will find me talking about trolls to my friend Lucy Coats, over at Scribble City Central, her wonderful blog devoted to all things mythic. She's currently compiling a fascinating alphabet of mythical creatures, with help from many great fantasy writers: and we've reached the T's. Click on Scribble City, and I'll see you there! Maurya: (raising her head and speaking as if she did not see the people around her) They're all gone now, and there isn't anything more the sea can do to me.... I'll have no call now to be up crying and praying when the wind breaks from the south, and you can hear the surf is in the east, and the surf is in the west, making a great stir with the two noises, and they hitting one on the other. I'll have no call now to be going down and getting Holy Water in the dark nights after Samhain, and I won't care what way the sea is when the other women will be keening. 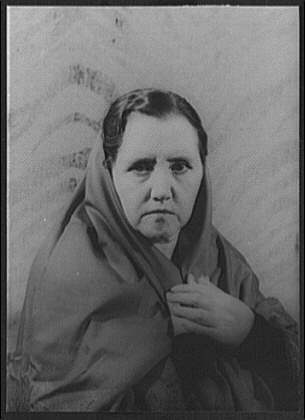 '(To Nora)' Give me the Holy Water, Nora; there's a small sup still on the dresser. But from such ordinary/extraordinary folk sprang the great poet Anon., without whom we would have no Border ballads, no Thomas the Rhymer or Tam Lin… no fairytales, no myths, no legends, no Bible, all of which were made up and told aloud by Mr and Mrs Anon long before they were written down and published in big, thick books. It's unimaginable. We’d have no proverbs, no skipping rhymes, no riddles, no jokes. People are just naturals at using colourful speech: you really and truly do not have to learn to read or write in order to appreciate beauty and express yourself. I was reminded of all this by a section in a rather lovely book called ‘Folklore on The American Land’ by Duncan Emrich, pub. Little, Brown & Company, 1972. Here are some extracts. I gotta pain in my side, Oh Ah! I gotta pain in my stomach, Oh Ah! Children make these things up! 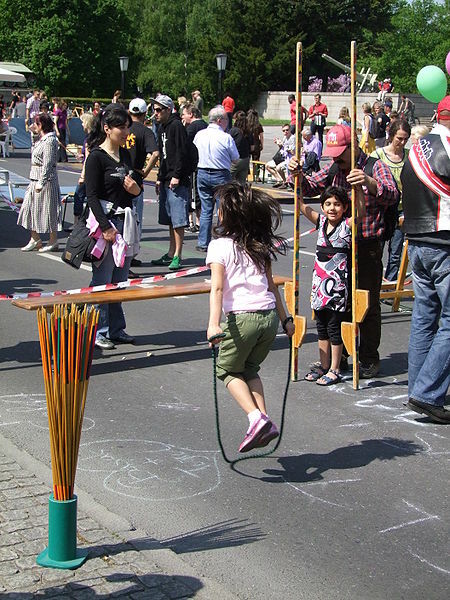 Children! And from the Ozarks (from the French ‘Aux Arks’ – Arks: shortened form for Arkansas), Emrich provides any number of proverbial phrases and ways of speech.